If you’re reading this I’ve succeeded. Good I’ve done something right at last. I’ve been thinking about it for ages., so don’t go thinking it was a sudden decision. The only thing holding me back was the fact that I’m a pathetic coward. But, in the end I knew I could do it really. It’s not so hard, not when you’re at the end of the line. And I am now, believe me. Jess's life is difficult enough without Kez picking on her – it’s turning school from a safe place into a nightmare. Kez has plenty of problems too but she finds comfort in knowing she is better off than Jess - or so she thinks. 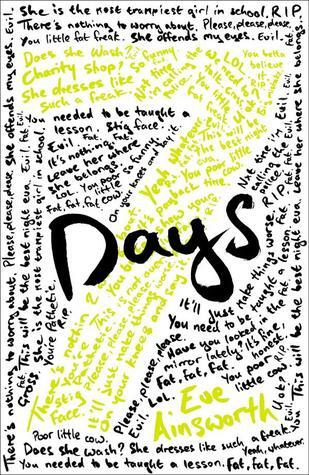 This is one of the best contemporary teen books I’ve read recently. I would put it at the same level as Non Pratt’s Trouble. Seriously, this author knows her teens and writes about the real issues that are happening right now. Being the mother of twin teens, I found it very realistic. I kept nodding my head in agreement as issues raised. This book looks very closely at bullying. It shows the brutal reality of bullying today, that follows a child where ever they go. For our teens, they can never get away from bullying; it is always there at the end of their mobile phones, via Facebook, Snapchat and Twitter. There is no escape from it. This is a frightening reality of today’s youth culture. The plot in this book grabs hold of bullying and turns in on it’s head. What happens when the bully realises exactly what every else thinks about them? This book shows you just that. Not only does it deal with bullying but it also looks at family relationships in depth. The book is told from a dual perspective, allowing us to see exactly why Kez and Jess act the way they are do. Kez may be the bully at school, but she is experiencing bullying herself on a day to day basis from her father, who takes out all his aggression on Kez and her mother. The scene involving dinner was extremely hard to read. Jess is struggling with her weight issues; the last thing she needs is everyone else giving their opinion. She finds comfort in food, which fills the hole that her father left when he moved out. My favourite character in this book was Lyn. It was refreshing to see that he went against the stereotypical role of most popular boy in the school. He showed that old friendship ties mean a lot and stand the test of time. This is one of those books I would advise all teens read. Every librarian in every secondary school, should be investing in a few copies of it. This book should be on the essential reading list, so that kids can talk about it in class and explore the issues it raises. This book is a quick read, but can’t be described as an easy read. Be prepared to get upset when you read it.